The first is my Pidge, which is a shorter scarf attached by two buttons. It will look like this when I am finished. 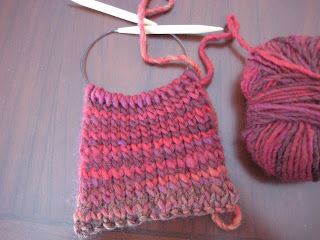 The fun, new thing about this project is the stitch pattern. It creates a “mock” double-knitted fabric. So, the right and wrong sides look exactly the same! This Pidge will match my new hat, so even though I might not have much longer to wear these items (being hopeful for spring and all), they will be totally ready to wear next fall/winter! My other project is a One Row (reversible) Lace Scarf. 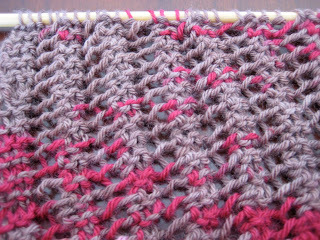 I’m using sock yarn in Cherry Cola. Doesn’t it look yummy? 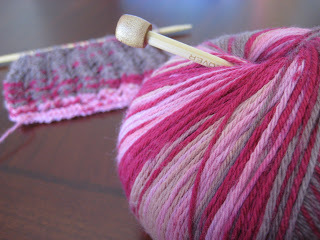 I probably will have enough yarn to make two of these scarves … A springy one for me, and one for a friend! 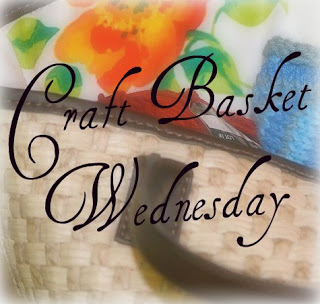 For more craft baskets, visit Knit Together. 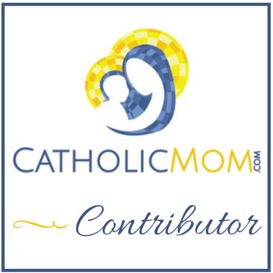 I adore the colours you are using for these projects. I am hoping to start my Tasha Tudoe Shawl this Autumn. Have you ever made a shawl. I am a bit nervous about it. I have enjoyed visiting again. Oh that lace looks so pretty! And I have to agree with Gae that I love the colors too!